Well, she might be able to enjoy some fast food while she watches her favorite basketball team. But, it probably won’t taste like it used to. 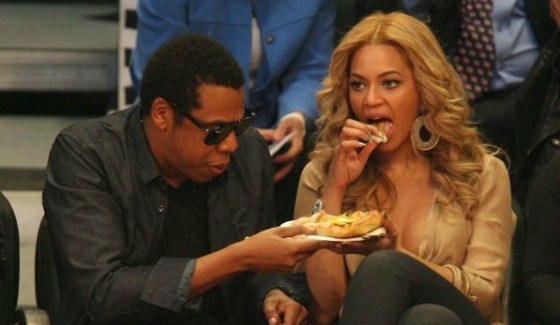 And we know Queen Bey loves her fast food. On Thursday, the Food and Drug Administration moved to remove most trans fats from most of our favorite fattening foods. This includes popular indulgences like doughnuts, microwave popcorn, crackers, frozen pizzas, and a host of other foods we love to love. Apparently these fats are linked to heart disease and death. Who knew? What’s so wrong with trans fats? Well unlike saturated fats which also raise LDL or “bad” cholesterol, trans fats work to lower HDL or “good” cholesterol. This means that in addition to blocking your arteries, trans fats also work to decrease your general health. It’s like a double whammy. Why have trans fats been added to food in the first place? Well, adding trans fat comes from adding hydrogen to the oil in the food. This process, called “hydrogenation,” increases the shelf life, makes food feel less greasy, and decreases its chances of spoiling. Our food doesn’t spoil because we weaponize it in factories. Well, that sounds completely safe, right? The FDA found that this substance is just unhealthy. Reportedly, “avoiding foods containing artificially produced trans fat could prevent 10,000 to 20,000 heart attacks and 3,000 to 7,000 coronary heart disease deaths each year, according to one study from the U.S. Centers for Disease Control and Prevention.” So, basically, trans fats are a public epidemic. We are, in essence, eating ourselves to death cause it tastes good. Disturbing. This move seems timely given the fact that heart disease is a leading cause of death both in our country and globally. Heart disease is preventable via a healthy diet and regular exercise. Like Type 2 diabetes, it is typically brought on by ongoing unhealthy behaviors which reduce the body’s ability to function properly. Our bodies lose the fervor to fight against disease when we feed them poison. It’s like putting sugar in a car’s gas tank and expecting it to run normally. Overall, this is a major victory for Americans. Obesity is not a joke. Nor, is heart disease. And, when the FDA steps up to prevent sure death, we can be confident that our government is working in our favor and not in favor of the consumer products industry. Food manufacturers have been willing to feed us this crap for decades. No one can tell me they didn’t know of the potentially harmful effects these food could have on their consumers. So, while I feel the need to run straight to my local doughnut shop and indulge in something glazed or sprinkled before they get the memo, I am happy to know that my children won’t grow up in a country that sneaks them poison in food’s clothing. That’s a win for all of us. Now let me get my keys….I have to ummm run an errand. Bey, I feel you girl! November 13, 2014 Doritos-Flavored Mountain Dew? I’ll Pass. Next story Shooter’s Lawyer Calls Renisha McBride’s Murder “Justified.” Right.